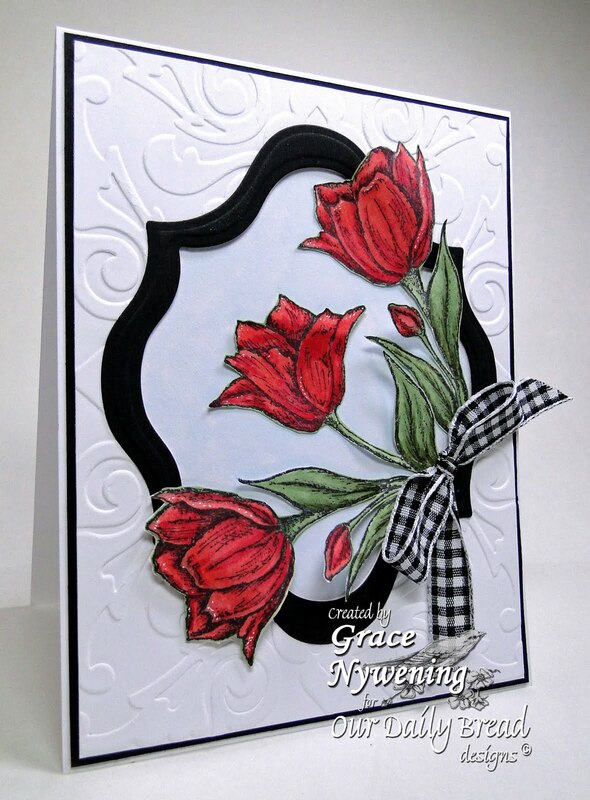 Design a card or project using RED, WHITE (OR CREAM) AND BLACK! I drew my inspiration from the colors and also the checked patterns. What a pretty kitchen! 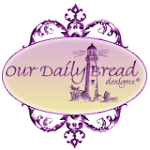 I used this month's release from Our Daily Bread designs, Tulip Corner and stamped with Memento ink, and colored with Copics (R14,24,29 &46) and G99, 94 and 82). My card stock is Flourishes. It's very white and I love it! I used Spellbinders Label Thirteen in two largest sizes to create my frame from Basic Black. 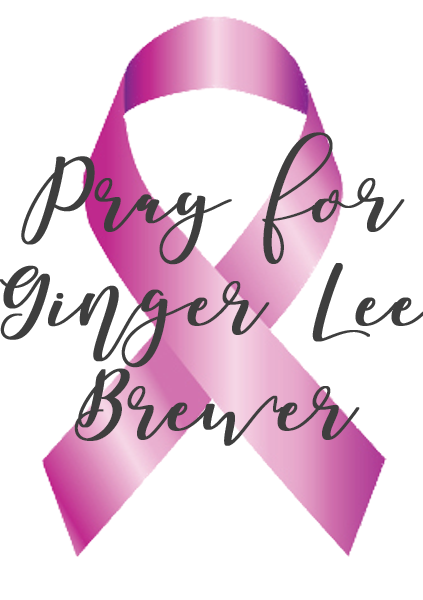 I used a Sizzix embossing folder (sorry I don't know the name). The ribbon was from my stash. I attempted this week's Double Embossing technique on SCS but failed so my center panel is cut out. I lightly colored the bg with B000 to pop my colors a bit. I also used today's IC274 on SCS. Red black and white is such a striking combination....those red tulips are really wonderful Grace. 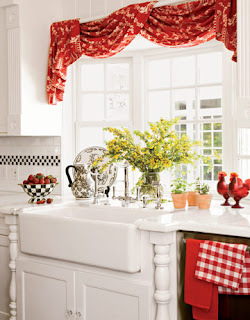 Love the sweetness of the gingham ribbon too! What a pretty card. Love the way it came out. Thanx for playing Incy Wincy this week. Hope to see you next week. your card is so noble and stylish! This is gorgeous Grace!! I just love the red and white and the embossing together. Such elegance. Hope you are having a good weekend my friend. Oh wonderful! Love this embossing technique with the blank inside!! Thanks for playing along with us this week at DYSU. Such a gorgeous card with beautiful tulips!!! I'm enjoying seeing the cards you make. The tulips card is striking! Very classy and elegant card. You nailed this challenge! Grace, this card is gorgeous. I've been really wanting to do black and white these days, not quite sure why. But since they aren't 'my' colors, I still have a hard time designing something with them. Your card has opened up lots of ideas for me, so - Thank You! And thanks for the challenge link. One of the girls is a photography hobbiest and this is the kind of challenge she (and I) like! Beautiful card! Love the flowers and coloring. Beautiful colors! your card is beautiful. I love your coloring. It looks so fresh and pretty. Grace- I love how you have those tulips cut out. What a BEAUTY! Loved the color combo. Makes it look so clean.. Thank you for joining us at CRAFT US CRAZY . Very pretty card, love the image. Beautiful flowers! Great embossing! Thanks for playing along with Delightful Challenges. I hope you will play again next week. 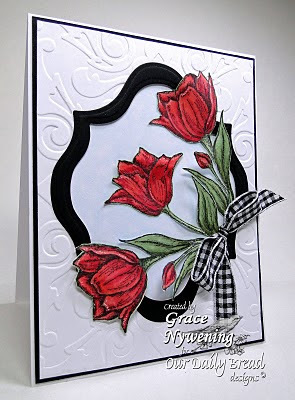 Understated elegance Grace, my favourite colour combo too so I am very attracted to your beautiful card! Thanks for playing along with us this week over at Delicious Doodles. Such an elegant card hun! Lovely! Thanks for playing at the Delicious Doodles Challenge, and good luck! Beautiful, beautiful, BEAUTIFUL! WOW! 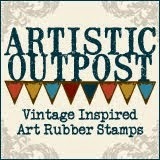 Thank you so much for sharing your touchy-feely awesomeness with us at StampInsanitY! What a stunning card you have created! !